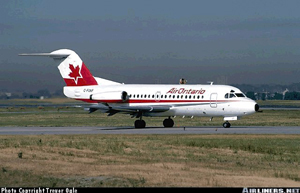 Flight 1363, a Fokker 28 airplane operated by Air Ontario, departed Thunder Bay (Ontario) about one hour behind schedule, on a flight to Winnipeg, with an intermediate stop in Dryden. During the stop in Dryden, heavy snow fell, covering, and freezing on the wings. Flight 1363 arrived from Winnipeg with an inoperative Auxiliary Power Unit (APU), and since the airport had no ground start equipment, the flight was required to keep one engine running during passenger loading/unloading. With an engine running, it was not possible to deice the airplane even though heavy snowfall existed at Dryden. At 12:09 local time, with ice accumulations on the wings, the airplane started its take-off roll using slush-covered runway 29. The pilot flying rotated the airplane at the prescribed speed, however, the airplane lifted off momentarily and then settled back onto the runway. Following a second rotation, the airplane lifted off at the 5700 foot point of the 6000 foot runway. No altitude was gained and the aircraft settled in a nose-high attitude, striking trees. The aircraft crashed, and came to rest in a wooded area approximately 3200 feet past the departure end of the runway and caught fire. Both pilots, one flight attendant, and twenty-one passengers were killed. Forty-four passengers and one crew member survived with injuries. The investigation commission concluded that the Captain, "as the pilot-in-command, must bear responsibility for the decision to land and take off in Dryden on the day in question. However, it is equally clear that the air transportation system failed him by allowing him to be placed in a situation where he did not have all the necessary tools that should have supported him in making the proper decision."